Have you heard of the Asian Hornet? It flirted with the headlines in 2016 and 2017, and we'd like it if it never became headline news again, but that's where we need your vigilance. So let's start at the beginning. The Asian Hornet comes from America. (Ok, ok, it comes from East Asia, but I wanted to ensure you were concentrating!) In its homeland, it is just part of the natural web of life, but it was accidentally imported to mainland Europe, possibly in a consignment of pottery, with the first record in 2005 in France. Since then it has become established and spread widely. The problem is that the Asian Hornet is a voracious predator of other bees, which in Europe just don't have the experience and evolutionary mechanisms to deal with this new threat. The Asian Hornet seems to target the nesting sites of, in particular, colonial bee species, so in summer it is often found hovering in front of Honeybee hives waiting to pick off returning workers, and sometimes the colony becomes too scared to even leave the hive. A number of other bee species are also at risk from the Asian Hornet, so its impact on such a key group of pollinators is deeply concerning. The good news, as far as the UK is concerned, is that Asian Hornets have only been sighted three times here so far – twice in southwest England and once in Scotland. Even better, these were reported quickly to the relevant authorities and fortunately were not able to establish themselves. But the risk is very high that they will arrive again. 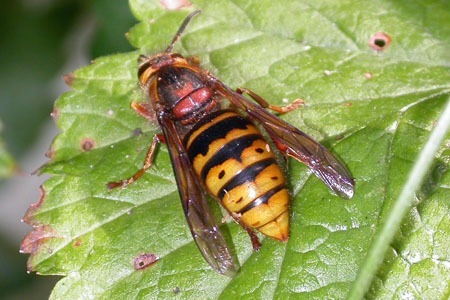 So the RSPB is encouraging everyone to be vigilant and watch for Asian Hornets as now is time of year when mated queens could be emerging from hibernation (for, like most bumblebees, it is only the queens that survive the winter). 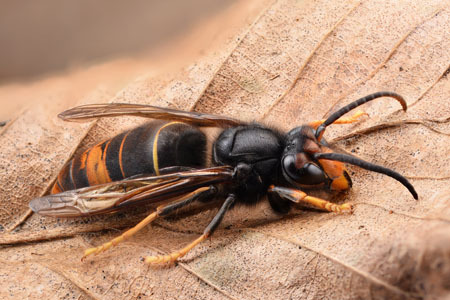 If enough people keep an eye out for Asian hornets, and report any suspected sightings quickly to the authorities, there is a good chance of preventing Asian Hornets from colonising. It means knowing what to look out for, and where. To get your eye in, it helps to know what our own native Hornet looks like, which is larger than a wasp but still with lots of yellow on the abdomen (the tail end). Here's one I photographed a couple of years ago. There are also some really large hoverflies in southern Britain that have evolved to look like Hornets. 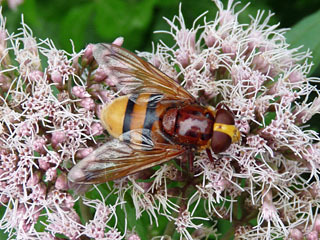 Here is one (below) in my garden, called Volucella. They, too, have plenty of yellow on the abdomen. And there are also some large native woodwasps that look rather similar. The Asian Hornet is not quite as big as our Hornet, and is much darker, but with an orange face and one thick orangey stripe across its abdomen. This excellent photo by Gilles San Martin shows its features off brilliantly. If you think you have seen one, the advice is not to try and kill it yourself, but to alert the authorities using this website here. It is important they know of all potential sightings so they can build a picture of if, when and where Asian Hornets are arriving, so don't be afraid to send in a report even if you weren't quite sure. And just familiarise yourself with it. There is more information on the RSPB website here, and here. What I don't want to do with this blog is demonise the Asian Hornet (for it didn't ask to be brought to Europe). And especially I don't want to demonise our own native Hornet or wasps. Yes, they can be scary, but our native species are an important and integral part of the natural foodchains. They are part of 'our nature'. The story of the Asian Hornet is yet another reminder of how careful Humankind needs to be as it assists – sometimes knowingly, sometimes unwittingly – non-native species to move around the globe to places where their impacts can be catastrophic, or expensive, or both.